Height adjustable, lumbar support option. Can be installed or replaced in the field. Pivoting height, adjustable headrest. Can be installed or replaced in the field. The Bravo back may also be covered with fabric over the mesh. 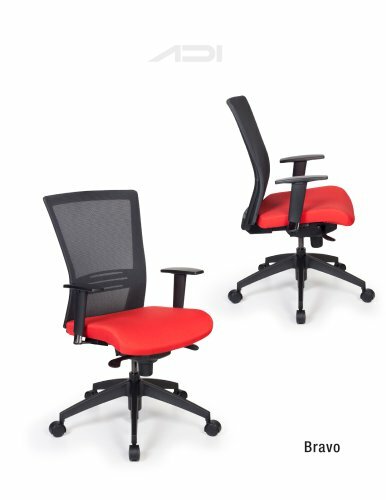 The chair thus keeps its slim look while allowing a variety of back colors. Please refer to the price book for color selection. Offered in a stool version and as a visitor chair with many base options, its versatility will meet the most demanding requirements in a work environment. As a conference chair, equipped with our sloped, supple and resistant foam arm, it will slide under the table without damaging it. REENGUARD* Indoor Air Quality Certified Greenguard certified, manufactured in ADI's iSO 9001 and iSO 14001 compliant facility.